This Heavy Duty Heatsink Motor Plate is precision machined from high strength 7075S aircraft grade aluminum for extreme durability. The extra thick 10mm plate is gunmetal anodized to match other aluminum parts. 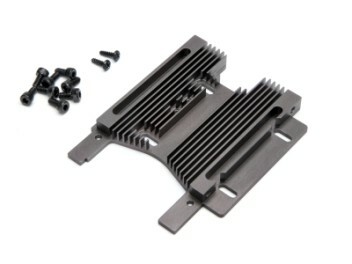 The plate uses heat sink fins to draw heat away from the motor to keep it running cool, for longer run time and extended motor life. This is an official HPI replacement part for the stock motor mount on the Savage Flux HP truck, and it can also be used for custom Savage conversions. Mounting screws are included.